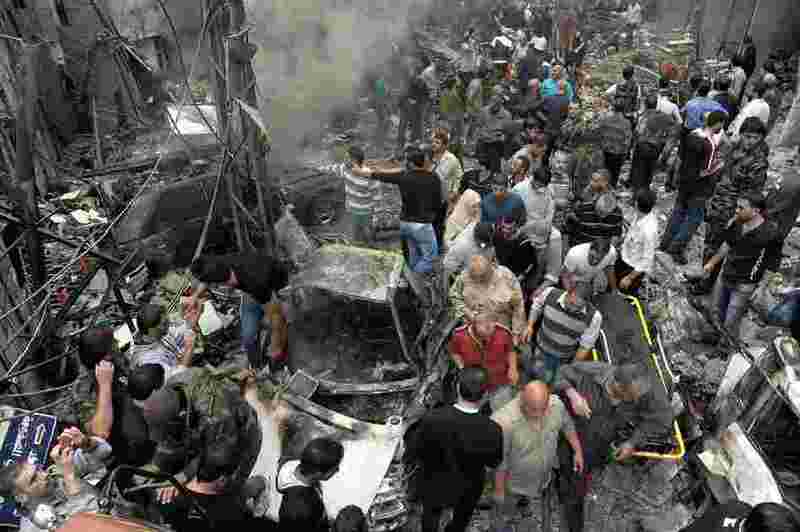 Syrians gather at the site of a car bombing Monday that killed 11 people and wounded dozens in the capital Damascus, according to the SANA news agency, which provided the photo. The violence in the city was described as some of the worst in recent months. â" Two deadly car bombings took place, one in a residential neighborhood in Damascus that killed 11 people, according to Syria's state-run SANA news agency. The other one, near the central city of Hama, generated wildly conflicting claims. An activist group, the Syrian Observatory for Human Rights, said the suicide attack killed 50 government soldiers and allied gunmen. But the government put the death toll at two civilians. â" Palestinian refugees, who have mostly stayed out of the Syrian fighting, fought on both the pro-government and anti-government sides in battles around Damascus, according to The Associated Press. One of the flashpoints was the Yarmouk, the biggest Palestinian refugee camp in Syria. Overall, the fighting in the Syrian capital was described as some of the worst in months. â" The northern city of Aleppo, one of the main battlegrounds the past few months, was again the scene of heavy shooting. "We are living in terror at night," a Syrian pharmacist named Samir told AFP following fighting in Aleppo. "We hear everything â" gun battles, tank shelling, explosions...The clashes before dawn today were the worst all week." â" The Syrian Observatory for Human Rights also reported air raids that targeted several sites in northern Syria, including the town of Haram, where it said 20 rebels were killed.